There's a school of thought that the only powered saw required for a workshop is a bandsaw. This concept is easier to accept if you're setting up rather than down-sizing. If you're in that camp then all I can suggest is that you make sure you choose a good one that's over-specified for the general run of work you intend to do. With extra capacity one can expect a larger motor and this will stand you in good stead for all manner of procedures. The iTech BS600 is one such machine with a 3hp motor only available as a three-phase option. With a maximum cut depth of 370mm and width of 550mm there's plenty of scope to work large sections and with a good choice of blade, produce your own veneers. More than any other machine in the workshop, the choice of blade and its condition will have the greatest impact on the level of accuracy to which you can reliably work - see F&C 187 for our guide. Having said that, there are a number of factors that will help you to get the most out of your blade, the first being blade guides. The iTech BS600 has sturdy, but more importantly easily accessible, guides above and below the cast iron table. 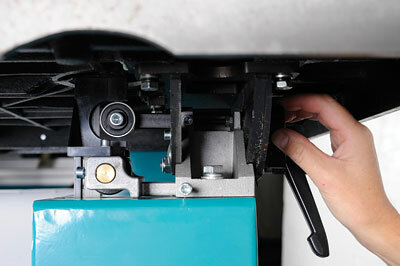 Raising and lowering the blade guard on any bandsaw will alter the setting of these guides so it's important to be able to adjust them without a struggle and, luckily, a single hex key - supplied - is the only tooling required. The lateral bearings, top and bottom, are face-oriented as is the top thrust bearing. 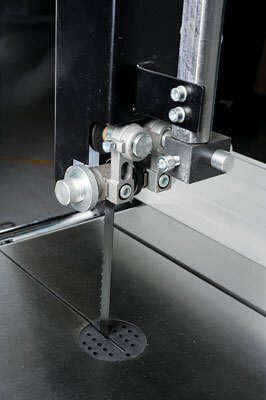 Below, there is an edge-oriented thrust bearing adjusted via an extended thread within easy reach of the table trunnion. The table will tilt to 45°/-5° with the aid of a toothed wheel and box spanner - also supplied. The angles are recorded on a scale that can be calibrated, but should be treated as an indication only. The fence is a familiar unit: a cast iron bracket mounted onto a steel rod and aluminium extrusion. It appears on a number of well-known, branded machines and is an indication of the iTech's origins. There's plenty of scope for adjustment on each of these components, so nothing to worry about there. With a machine of this size you'll want to know the framework can withstand the amount of tension required to run the largest blade - 35mm - although there's often some confusion about the importance of tension over blade quality and sharpness for good results. The iTech BS600 takes a little of the guesswork out of this by incorporating a tension scale in the top wheel chamber. The casework is around 2.5mm thick and well finished throughout. The Bristol levers and other controls are either metal or of high quality plastic. 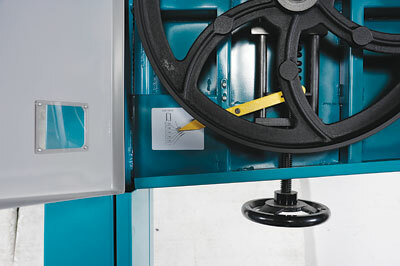 The doors are fitted with micro safety switches and do not snag on any other parts of the machine when opened. Mounted on the outside at the rear there is a lock and adjuster to set the wheels to run coplanar and shift the blade across the wheels' edge. Inside the lower chamber there are two extraction ports and a very substantial bristle brush to clear the wheel of dust and prevent the same waste material from re-circulating around the machine. This is a single speed machine, so not suitable for running metal-cutting blades. The twin belt drive can be tensioned from outside the cabinet to make the most of the power available. Coming back to my original point that a bandsaw might be the only powered saw you need in the workshop, the iTech BS600 is definitely worth a look. The table is not of generous proportions but quite adequate. Extending this is no hardship, so it may work in your favour if you have your heart set on a large capacity machine in limited space. Apart from the main on/off switch, which is very basic, it is hard to tell where the savings have come from to produce a quality machine. In short, it is a lot of machine for the money.